This week started with the notion that I was going to make a big dish of potato salad. I boiled the potatoes so that they would be ready when I needed them and stuck them in a bowl in fridge. That was Sunday. Monday was super busy and I didn't get a chance to get to the potaoes, but that was ok, I figured I would just make it the for Tuesday. (which has officially been dubbed family dinner night). But for the first time, my sister declined potatoes and said she was already making goulash, which turned out that no one really wanted to eat. (I bet they would have eaten the potato salad) And Wednesday we were in Montreal so no go there. So last night (now Thursday) when I opened the fridge to contemplate the dinner options, I knew that whatever I was going to make, the potatoes had to be used. I could have made the potato salad that I had been planning on making all week, but the potaotes were a little on the weird side, not bad, just not the best. They needed to be cooked. Plus, I had eaten the avocados and tomatoes that I had planned on using for the potatoes so I think it just wasn't meant to be. I was tired, so nothing to elaborate was going to happen. I wasn't feeling like spending too much time in the kitchen cause I really wanted to bike to the garden. I already had my giant dinner salad made and the mr. was pretty hungry, so split decision. That mr.. he has got it made with me. The stuff. Sliced up cold boiled potatoes, cheese, garlic and onion powder, salt and pepper. and a little bit of oil. And we need guacamole, salsa, something spicy in the form of jalapeño jam (I use it on everything!) and a bunch of fresh cilantro. 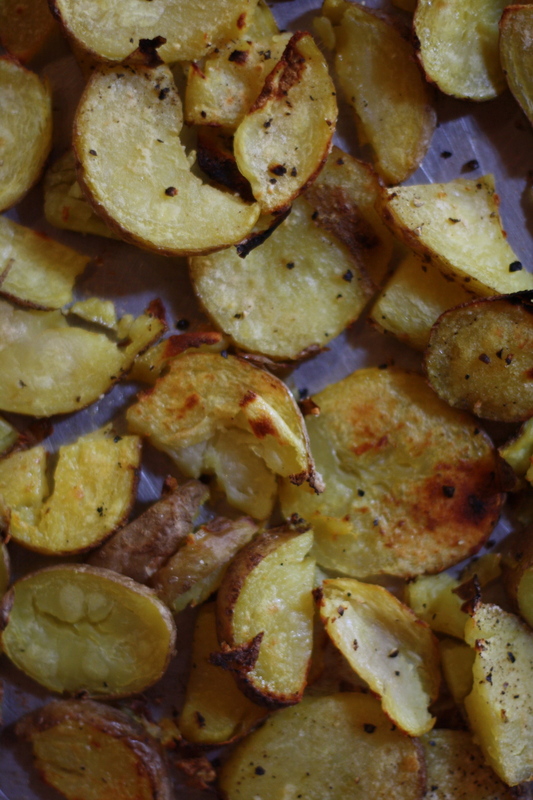 Spread the sliced potatoes on a lightly oiled baking sheet and drizzle with a tad bit more oil. Sprinkle with the spices and salt and pepper and pop those suckers into the oven. Once the poatoes turn a golden brown and are all crispy, remove from the oven and sprinkle on the shredded cheese. Toss on a few spoonfuls of salsa, and add on the jalapeños. Pop back into the oven for another minutes or two until the cheese is all melty. And cover the potatoes with lots of freshly chopped cilantro. Serve with extra salsa, guacamole and if you have it, more jalapeño jam. Happy Friday..Have an excellent weekend! *note.. These last three ingredients are optional, but you should definitely use them all. 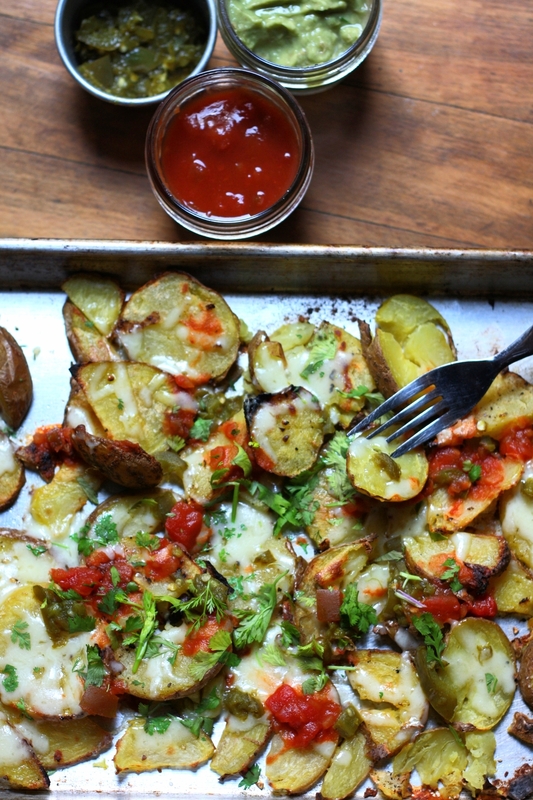 Thinly slice potatoes and place on a lightly oiled baking sheet. Drizzle with a bit more oil and sprinkle with the garlic and onion powder, salt and pepper. Stick into oven until potatoes are brown and crispy. 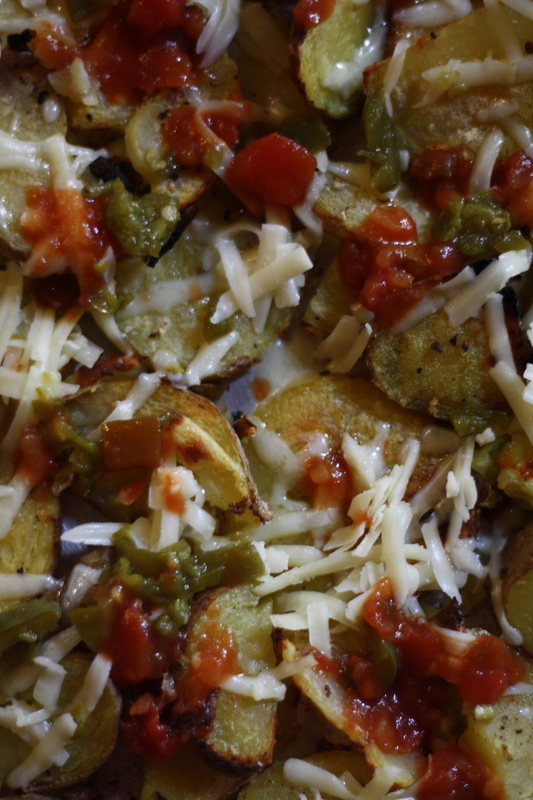 Remove from the oven, sprinkle on the cheese, toss on the jalapeños and some globs of salsa. Place back into oven for a minutes or two or until the cheese is all melty. Remove from oven and cover with a handful of freshly chopped cilantro. Serve with more salsa, guacamole, and more jalapeños. If eating all yourself, eat directly from baking sheet or if sharing, transfer onto a plates. (or eat from the baking sheet..less dishes, more conversation) Forks and fingers work equally.